Last week we had friends for dinner, and I wound up with a bunch of left over roast chicken. Under normal circumstances, I'd just use up the left-overs in another meal but since we were leaving for several months, I had to either toss the food, or find a way to use it. I hate tossing out good food so I turned to the fridge and freezer to see what I could come up with (yeah, we had to use or give away all the food in the fridge and freezer too). 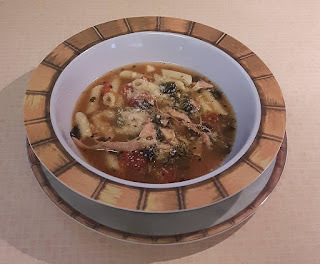 The soup turned out pretty good by all accounts - for my husband to eat anything with spinach in it, the food has to be very good (he hates spinach and won't usually eat it). Because I made it on the fly, I don't have exact measurements and in truth, exact measurements aren't really necessary for soups unless it's some sort of gourmet recipe and this one isn't. Just good, old fashioned homemade soup. cups of chicken broth left over from roasting it. 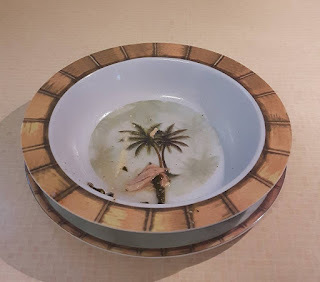 I pulled all the skin off and put it into a pot with another 4 cups of water, then added the bones/carcass and boiled it (wait til it comes to a full rolling boil and then turn it down to medium and let it stew) for an hour while I figured out what else to put it into the soup. With chicken soup, I usually add sliced fresh carrots and white or yellow onions, but ... I had no carrots left to use up. I settled instead on some chopped spinach (about 2 cups) and 2 cups of chopped green onions. Then I drained a can of diced tomatoes and added those. Last, I drained the carcass pot and added the broth to the soup pot, discarding the bones and skin. At this point, it smelled pretty good, but it was missing something ... pasta or noodles, and so I dug around in the cupboard and came up with a Knorr Penne Parmesan side dish. Nothing I could do except pour it in and hoped it would be okay. I guess it was okay. Everyone loved it - the neighbours enjoyed a good home made feed on us before we headed out, and I had a new recipe that my husband would actually eat. 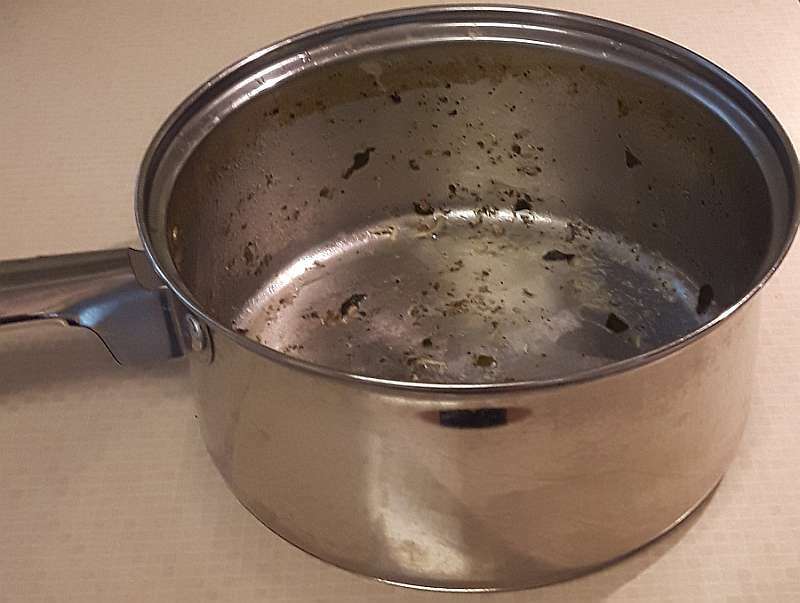 The pot I used holds about 12 cups in total, so it's probably easiest to add all the ingredients except the broth and add the broth last. If you didn't save your broth or carcass (or are using something like chicken breasts instead) you can always use canned or packaged chicken broth if you prefer. The Knorr side dish adds enough spices and a touch of thickening to the soup but if you prefer just to use noodles, be sure to add a spoonful (tbsp) of spice (Italian spices would be good) or salt and pepper. Serve the hot soup with fresh grated parmesan on top (and a nice thick slice of garlic bread would make a good complement to the soup instead of crackers). Oh, there is one other thing I should mention ... if you don't often use the juices from your meats (any meats) to make gravy or sauces, keep a container in the freezer and add your meat juices to the same container whenever you have them. When you need or want to make a rich soup broth (or gravy) all those meat juices added together make a nice rich flavour without having to add anything more.